Perennial in the Iris family with light green, long and narrow leaves (90 x 2 cm) that spreads with underground rhizomes. Sprays of bright orange flowers held on long, thin, zig-zag stems, arising from the foliage clumps during late summer. Can become invasive in mild, wet climates as it tolerates many adverse conditions including grazing. The seeds are not a problem, since not many are produced, but the plants can multiply and spread rapidly via their corms and rhizomes. In New Zealand and some other parts of the world Crocosmia x crocosmiiflora is regarded as an environmental weed, competing with ground covering shrubs and native seedlings. Crocosmia x crocosmiiflora is a hybrid bred in France in 1880 by crossing two African species Crocosmia aurea and Crocosmia pottsii. Prefers a sunny, sheltered spot in well-draining soil, but will adapt to most soils and tolerates partial shade, heat, and moist soils. Quite drought tolerant, but benefits from an occasional watering during exceptionally dry weather. Frost hardy (zones 5-9). In cold climates, the corms can be lifted and stored in a cool, dry place until spring. Easy to grow and consistently produces lots of flowers. Divide the clump after a few years to maintain vigour. Suitable for containers and cut flowers. Beautiful bright colours. Originally from South Africa, Eucomis comosa is a winter-dormant bulbous plant with a basal rosette of strap-shaped fleshy, bright green leaves with maroon spots. The cream, waxy flowers are arranged in tight spikes with a tuft of green bracts at the top. There are several hybrids, such as 'Sparkling Burgundy' which emerges in spring with burgundy-red foliage, changes to green later and reverts back once the flowers fade. Its flowers are dark pink and the spikes have a tuft of purple bracts at the top. 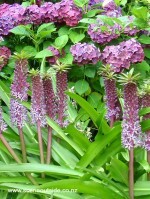 The photograph that shows hydrangeas in the background is of Eucomis comosa 'Reuben', bred by New Zealand grower Eddie Welsh. Prefers a sunny position in any well-draining soil that is relatively dry in winter and moist in summer. Tolerates partial shade, but the best flower and foliage colours are produced in full sun. Suitable for USDA zone 8, but in areas where heavy frosts may occur, Eucomis comosa is best grown in a container and moved to a frost-free location during winter. Bulbs can also be lifted each autumn, stored in a dry medium, such as peat, and planted out again in spring. Easy to divide, but smaller bulbs may not flower in the first year after division. Beautiful plant, in particular the pink-flowering varieties. As cut flowers they last for many weeks. Small, perennial, early spring-flowering bulb to about 20 cm tall. Slightly fragrant blue, purple or white flowers in dense 5 cm long spikes, resembling clusters of upside-down grapes. Narrow, linear leaves appear in autumn and die down in summer after which they can be removed. Reproduces by offsets from the main bulb and seed dispersal. Occurs naturally in forests and meadows of Eastern Mediterranean regions. Prefers full sun or partial shade and well drained soil. Generally trouble-free, but susceptible to root rot in wet sites. Divide large clumps in summer. Looks great when planted in groups. Perennial bulb, native to South Africa, with strap-shaped leaves and umbels of up to 20 lily-like flowers. The plant is dormant during summer, sending up flower stems in early autumn, with new leaves emerging soon afterwards. The leaves are rather like those of Agapanthus. The bright reddish orange flowers are funnel-shaped with recurved petals and protruding stamens. Breeding has led to several hybrids and cultivars with flower colours ranging from white to pink, red, and purple. It is not clear how bulbs of this South African plant ended up on the island of Guernsey more than 300 years ago, but they continue to be grown there for cut flower production. Nerine sarniensis prefers well-draining soil and full sun or a position where it receives sunlight for at least half of the day. Plant with the top part of the bulb (neck) exposed. Keep dry during summer, but, depending on the amount of rain fall, regular watering may be required during the growing season. Careful with fertilising, in particular with fertilsers high in nitrogen; this may encourage leaf-growth at the expense of flower production. Flowering can be erratic and fluctuating from year to year, possibly due to variations in environmental conditions.Tolerates brief periods of moderate frosts. Propagate by division, detaching the new bulbs that form around the main bulb, and replanting them straight away. Allow this beauty to be the star of early autumn and combine with plants that take over that role at other times of the year. Flowers last well on water. If you live in an area with cold winters, you can still enjoy Nerine sarniensis by growing the plant in a container and moving it indoors to overwinter in a well-lit place with good ventilation.